Iliotibial band (ITB) syndrome is a common cause of outer knee pain, which occurs due to irritation of the band as it inserts onto the outer part of the knee. This overuse injury is commonly seen in athletes who participate in activities with repetitive knee bending such as running, soccer and other endurance sports. There are many factors that can contribute to ITB syndrome including: limited hip, knee and ankle mobility and improper training techniques. Chiropractors can help to address these factors to prevent and effectively treat ITB syndrome. The Iliotibial band is a thickening of the fascia lata, which is the fascia that covers the outside of the thigh. It is a band of dense connective tissue that passes from the outside of the thigh to the outside of the shin. The Iliotibial band is a continuation of the tendinous portion of the tensor fascia lata (TFL) muscle, with some contribution from the gluteus maximus. The Iliotibial band provides stability to the outside of the knee and helps control inward motion of the hip and thigh. It also stabilizes the knee and thigh and prevents excessive side-to-side motion of the hip and thigh during walking or running. In the past ITB syndrome was thought to occur when a “tight” iliotibial band would rub or snap against the thigh (femoral condyle) irritating the iliotibial band or an underlying bursa. Newer research has demonstrated that this is not the case. Most individuals do not actually have a bursa at this location and the iliotibial band is a thick band of fascia that does not stretch, lengthen or get “tight”. In reality there is a fat pad that is located beneath the iliotibial band at this location. If there is limited strength or mobility in the hips, thighs or ankles, when the knee bends the iliotibial band compresses the outside aspect of the knee. The increased compression prevents blood flow from passing through the fat pad. With the decreased blood flow inflammation occurs within the fat pad causing irritation and pain. Due to the compressive nature of the injury aggressive hands on treatment or foam rolling directly over the irritated fat pad will continue to exacerbate the problem. ITB syndrome may be related to training errors and or your individual biomechanics. The following is a list of potential contributing factors. Excessive running in the same direction on a track. 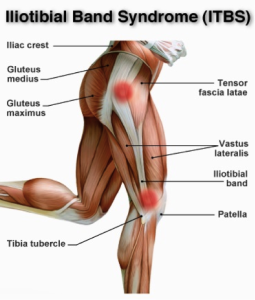 Weakness in the hip abductors (outer hip muscles). Many studies have found a relationship between poor hip abductor strength and iliotibial band syndrome. 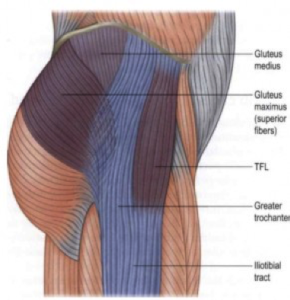 The hip abductors include: gluteus medius, minimus and tensor fascia lata (TFL), which are the muscles that make up the outer portion of the hip. Studies have found that runners with ITB syndrome have weaker hip abductor strength compared to non-injured subjects and compared to their non-injured legs. When the hip abductors are weak it causes the weak hip to drop inwards more than it should (see picture below: femoral adduction). This inwards dropping of the hip can lead to dynamic knee valgus. Dynamic knee valgus is an inwards collapse of the knee, which can place increased stress on the structures around the knee, including the Iiliotibial band insertion and fat pad. 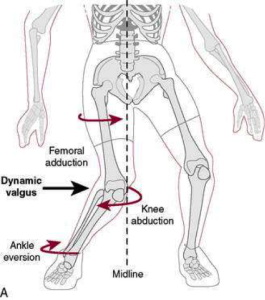 Poor ankle range of motion and strength has also been linked to dynamic knee valgus. Studies have found that during a squat, reduction in ankle dorsiflexion leads to the hip dropping inwards and a subsequent inward caving at the knee (dynamic knee valgus). The association between limited ankle dorsiflexion and hip abductor weakness during specific exercises emphasizes the importance of the kinetic chain in lower limb alignment and subsequent injury risk. The most common symptom of ITB syndrome is a sharp or burning pain in the outside part of the knee. Pain and or tension may also be felt along the iliotibial band (outer thigh). Swelling and or thickening of the iliotibial band and fat pad may also occur but is not as common. Cycling In the early stages of ITB syndrome patients may notice that knee pain starts after a specific amount of time or a specific distance. As the injury progresses patients may report that walking, stairs and sitting for long periods can also aggravate their pain. As discussed above, various lifestyle, training, and biomechanical factors can contribute to the development of ITB Syndrome. It’s fairly easy to self diagnose ITB syndrome however it’s much more difficult to identify the dysfunctions that may be contributing to your injury. A specific history, physical examination, diagnosis and treatment plan is critical to obtaining the fastest most effective results! At Mountain Health and Performance we utilize class IV laser therapy to decrease irritation of the fat pad and then employ soft tissue therapy (FR and ART) in addition to FRC rehabilitation principles to improve function of the joints and tissues that may be contributing to your injury. Iliotibial band tightness is not at the root of your knee pain. Furthermore, stretching the iliotibial band will not loosen or lengthen it. The iliotibial band is not a single discrete entity (as shown in anatomy textbooks). It is a dense connective tissue that is connected to the superficial fascia, which is continuous with the skin. A study in 2008 determined the amount of force it would take to lengthen some human fascia, including the iliotibial band. The authors found that it would take 2,000 lbs of force to lengthen your ITB 1%. They described this large amount of force as far outside the human physiological range. Long story short there is no way a therapist, foam roller or metal tool can actually lengthen the iliotibial band. If you have ITB syndrome, throw out your iliotibial stretches, stop foam rolling your iliotibial band and book and appointment to get the correct exercises and treatment to fix the root of the problem. The iliotibial band is a thick band of connective tissue that is different in structure from muscles. Due to its structure, the iliotibial band is difficult to stretch properly and even stretching it correctly won’t “loosen” it up or “lengthen it”. It’s important to understand that when any part of the body feels “tight” a stretch will not lengthen the tight tissue but has various other physiological effects that lead to the feeling of “lengthening” or “loosening”. Stretching and mobility exercises for the muscles and connective tissues surrounding the iliotibial band (quads, hamstrings, glutes etc.) may be beneficial but the correct exercises are critical to getting rid of your IT band pain. Studies have found that a hip abductor rehab program of 6 weeks can lead to a resolution of symptoms and strength gains. Current research indicates that hip abductors experience higher activation rates during single leg stability exercises. It is important to challenge your hip abductors in a single leg stance because during walking and running the hip abductors will stabilize the lower limb during the single leg stance phase of gait. Hip abductor strengthening has been observed to improve knee joint kinematics by reducing stress on the knee (dynamic knee valgus) thereby reducing compression on the iliotibial band and underlying fat pad. It’s also important that the hip abductors have good concentric and eccentric control. An eccentric contraction is the motion of an active muscle while it is lengthening under load. Eccentric training is repetitively doing eccentric muscle contractions. Eccentric training focuses on slowing down the elongation of the muscle process in order to challenge the muscles, which can lead to stronger muscles, faster muscle repair and increasing metabolic rate. Depending on your individual examination, additional exercises will be prescribed. These may include spine, hip, knee, ankle and or foot exercises. At Mountain Health & Performance we utilize the FRC system to rehabilitate various injuries because it focuses on exercises that improve strength AND flexibility. What you may need to work on may differ from the next person with iliotibial band syndrome, as there is no one size fits all approach to treatment or rehabilitation.